Oh blimey, why is time going so fast? I swear that as you get older time seems to pass more quickly. It seems only yesterday I wrote my last Music Monday post and then blink -10 days have passed. Where does the time go? It is categorically unfair! One minute I was 17, slim and looking to take on the world and the next minute I'm 45, with a somewhat larger arse and face rapidly looking like a Christmas turkey. Anyway, I'm not going to talk about saggy chins. That would be defeatist wouldn't it? Besides I'm good with a paring knife. My mother didn't teach me how to slice the runner beans from top to bottom for no good reason you know. I'm going to offer my services to David Cameron though - come on David you represent this country now get that saggy stuff seen to will you? We can't have a PM who looks like he's wearing his shirt on his face and not on his neck. Twisting your neck to one side can't hide it David! Either get under the scalpel or start wearing a polo neck. 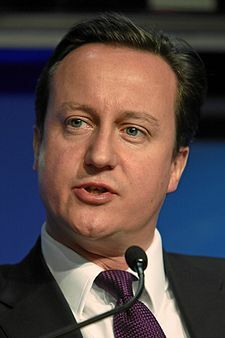 Although, on second thoughts it could be really cool to have a Prime Minister who wears polo necks. Hmm...If David teamed his polos with a handbag and some plus fours London Fashion Week might be as exciting as it was last year for the stylish man about town. Right, other than ageing rapidly what have I been up to? Well, I think it's more a case of what haven't I been up to. Yep, I looked in the utility room this morning and nearly passed out. It had got to that stage when there is so much stuff in there that the only sensible thing I can do is so curse like a mother *******, shut the door and pray to God that Mr T will sort it out before I slash my wrists. It's bad enough the place is loaded with laundry and sports equipment but there are also 3 of Mr T's latest purchases - a pressure washer, a box of extra attachments for said pressure washer and a chainsaw. Hmm.... needless to say I am pleased the new patio has been completed. And I'm still alive. Anyway, this morning I was looking for my Emergency First Aid kit (I have 4 of varying size as well as 3 medicine cabinets - all of which look like a small grenade has been set off inside them). The Emergency First Aid kit - is not in fact for emergencies ( well not medical ones) but perhaps could be better described as the "Get them off to School before you put your head in the oven" Kit. I'm sure you know what I mean - it houses the equipment us ladies use to placate small personages trying to pull a fast one at 8.25am when a tiny bruise has rapidly escalated to a situation where the small personage can no longer walk without the aid of an umbrella and/or six lumps of chocolate. 1. Chocolate. Always a true test of illness. If the "Sick" child cannot consume chocolate then there is a good chance they are genuinely ill or in severe pain. A more accurate method of diagnosing genuine illness has not yet be found. The theory behind this remarkable discovery has been credited to a Mrs Jane Turley, a housewife of extraordinary talent residing in the UK. Recently nominated for a Nobel prize Mrs Turley was quoted as saying "I spent years researching the best chocolate for the test and I concluded that children prefer milk chocolate. I'm still working on which dark chocolate is the most effective for adult hypochondriacs -it may take me some considerable time." 2. A roll of stretch plaster. Do not bother with individual plasters as you will never have the correct size or shape. They will either be too big, too small, too square, too rectangular or worse, too round. Small personages are very particular and will not wear a round plaster over a vertical or a horizontal cut. In addition, never buy gimmicky plasters with cartoon characters on them as this sets a dangerous precedent. Initially you may think a small cut warrants a Superman plaster but in time you will realise a bad cut warrants a Superman colouring book and an accident of more serious nature will involve the purchase of a Superman costume - or at the very least some small red pants to go with those blue tights you bought back in 1982.
c) A Broccoli and Celery Smoothie. So there you go; the five essentials for the EFAK. If you have to upgrade to the genuine emergency first aid kit then make sure you do what's best for child and trust your instincts; there is no better judge of illness than a mother's natural instinct. And what if it's that occasion when you really aren't sure and the symptoms could be something minor or something serious? My advice? Get it checked out and if you aren't satisfied get a second opinion. So yesterday I spent two hours in Casualty with Master Ben; it was my first trip there with him. I've been twice with Master Jacob who, on one occasion, had a bad fall on his arm and, on the other, decided to spoon feed himself a load of paracetamol (testimony for the fact that children's medicines should actually taste disgusting!) and I've also had one trip with Master Sam when he head butted a wall when he was a toddler. Anyway, fortunately, it turned out nothing was wrong with my little gem but 2 hours in Casualty is a sobering experience. It's a vivid reminder how quickly things change; how life can suddenly and dramatically be ended. So my friends, enjoy your day, may the sun shine, may your children be fit and well and may we all be thankful for another day upon this beautiful earth. And don't forget to keep the EFAK fully stocked. Drawing the various threads of your post together, why not assemble a CEFAK, as in 'Cabinet Emergency First Aid Kit', or possibly 'Coalition Emergency... (etc etc.)'. Item 1. Marmite. 'Never mind the tax system - If we can both eat marmite then we must really be friends after all.' Might also do something for DC's neck if it troubles you so much. "...a situation where the small personage can no longer walk without the aid of an umbrella and/or six lumps of chocolate." I thought that was only in OUR house. I nearly fell off my chair with this piece today - a joy, merci buckets. I'm off to stock my EFOK now. Love the Arnica. That stuff's better than Aloe. Tell Cameron I'll trade chins with him. But he won't want to. Sigh. For one moment I thought you were going to recommend a different solution to an untidy utility room; something along the lines of increasing the insurance on the house and tossing in a match and ... Bob's your uncle. Liked the link to this phrase too, although Wikipedia didn't really sound very convinced by its own suggestions this time. Hmm, perhaps we could do better. I think Bob was a fireman whose niece was an arsonist... Do you have an Uncle Bob, Mrs T? Cool one Mrs. T about the chocolate (should be cheese in my grandson's case)! Yes, truly visiting a big hospital's Casualty Dept. is so sobering. Whoops, just realised I went awol on my comments for a while:) Ahhh... I guarantee chocolate is a 100% accurate gauge of sickness Mrs B. Try it Mrs B and you will see!